This is the second post for today. Please scroll down if you want to see a peek for my exhibition. This card is for Mojo Monday 118. This sketch is simple and easy one for me to work with. But I'm not satisfied with how it turned out, because I think the color of the ribbon is not good. I couldn't find out the ribbon which matches perfectly to this cute DP from my stash! grrrrr! Thank you for stopping by today! Wishing you all have a wonderful Christmas! This will be the last post to show you my works for exhibition. 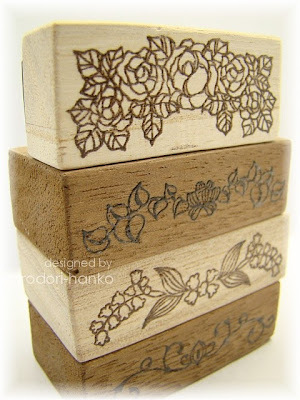 I've carved some ornamental stamps. And I made this card by using one of them. 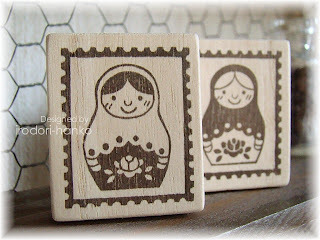 These are the ornamental stamps I designed and carved. How do you like them? If you are visiting here from Hong Kong, please keep the schedule to visit my exhibition in your mind! I hope you find out your favorite "FRIENDS" there. Happy Monday!! I'm sure that you all had a pretty busy weekend. I also was pretty busy with shopping, shopping and shopping!!! I was so tired that I could have good sleep at night. That means I had no time for crafting. lol! These are simple cards I made for my exhibition. I stamped the solid flower image and dried it with a heat-gun. After that, I stamped the sentiment over the image and heat-embossed it with clear EP. Here is a close up photo. These are just easy one, but I'm very satisfied with them. Thank you for stopping by. I'll be back with another card for my exhibition in a couple of days. Have a happy holiday week! Hello everyone! I'll also show you some other works for my exhibition today. Please don't say you already have become tired. lol!! These are stamps which has been mounted on an acrylic mount. 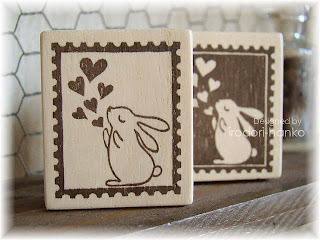 I usually mount my hand-carved stamp on a wood block which is cut by myself. 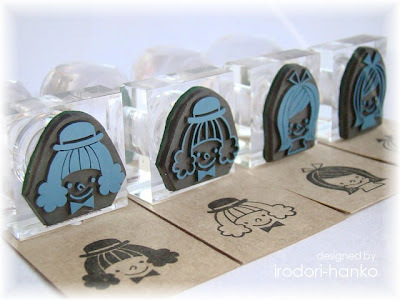 But this acrylic mount is very popular with Hong Kong customers, so I have made some stamps with acrylic mount. 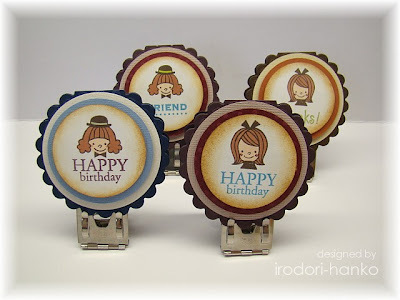 Here are some small circle cards which were made by using these stamps. The card base was cut out with Scalloped Circle Nestabilities(Spellbinders), and circle panels were cut out with circle cutter. Their skin and hair were colored with Copic Markers. Thank you for stopping by. See you! Hello everyone! As I said last week, I'm going to show you some of my works for the coming exhibition. 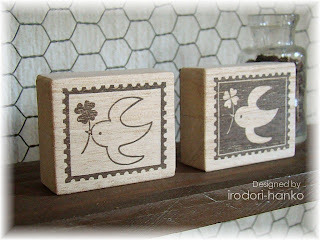 These stamps are remade version of my past designs. A bunny with some hearts, Russian nesting dolls, a bird with a four-leafed clover... All of them are my favorite! I framed each of them like a postal stamp. Hello everyone! I apologize to you for my long absence from blogging world. As you know, December is the busiest month in the year!!! And now... My head is filled with preparations for my exhibition. Preparations have not advanced easily as I expected, and I am often grieved for lack of my talent. Here is a peek of my works, "The girls with a message board". The height of the image is approximately 1.2". 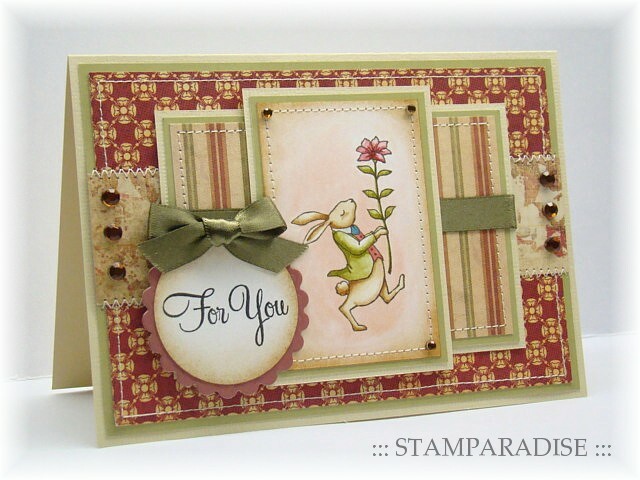 And here is a frame I made using these stamps. I stamped the images with Espresso ink (Versa Craft), and colored them with Copic Markers. Thank you for stopping by today! See you next week. 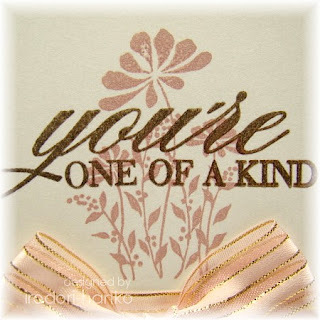 The card I'm showing you today is quite simple one. The sketch I used is from this weeks Mojo Monday(MOJO115). The image is a digital image which was drawn by me. (You can download it for free HERE if you like.) I colored her with Distress Inks, cut it out with NT Circle Cutter, and slightly sponged around the image with Antique Linen ink. The DP I used on back panel is from Basic Grey. I know this paper is not for christmas, but it reminds me of a snow-covered forest. So I thought it fit the christmas theme. 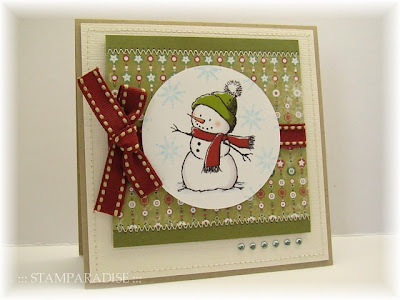 I added only one brad as embellishment because I wanted to keep my card simple. Here is the inside photo. All the edges of each panel was sponged with Antique linen ink (Distress Ink). 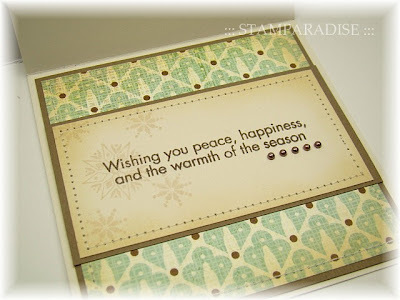 After I stamped the sentiment with Espresso ink (Versa Craft) and heat embossed it, I stamped snowflakes with Umber ink (Artnic). I did stitching with sewing machine and added some tiny chocolate pearls. I'm entering this card to these challenges. I have 2 cards to show you today. I made these cards day before yesterday, but I had no time to upload them till now. 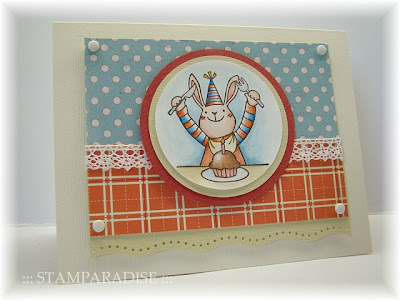 The 1st card was used the sketch from Mercy's Tuesday Sketch Challenge(MTSC 49). The image is a new stamp which was hand-carved by myself. I colored him with Holbein Artist Colored Pencils and Meltz Pen. The all edges of the focal panel and the back panel was slightly sponged with Distress Inks. I did stitching with sewing machine, and added some metal brads, a metal button and some linen twine. 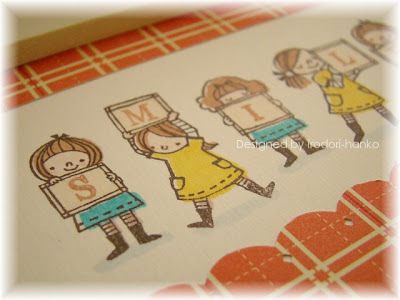 When I finished this card, I was in the mood to make another card that is for a girl. So I decided to carve a new stamp and to make a card with it! The dog has changed his clothes?! lol! 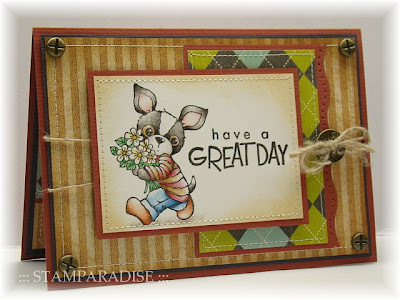 The sketch I used on this card is from the past Mojo Monday blog(MOJO109). She was colored with Holbein Artist Colored Pencils and Meltz pen,too. The scalloped circle was cut out with Nestabilities and the circles were cut out with NT Circle Cutter. I did stitching with sewing machine, and added some pearls, lace and a bow to finish the card. I hope you like both cards! I'm showing you a christmas card I made yesterday. This card was used the sketch from this weeks Mojo Monday(MOJO114). I love the scalloped border across the top on this sketch! :) My scalloped border was cut out with EK success Edger Punch(Scalｌoped Diamond). 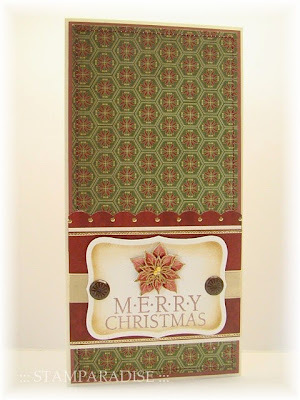 To make the focus pannel, I stenciled a snowflake using a peel off's from Magenta and Antique Linen ink(Distress Ink). 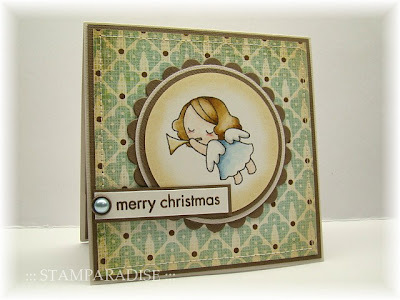 After that, I stamped the sentiment with Espresso ink(Versa Craft). 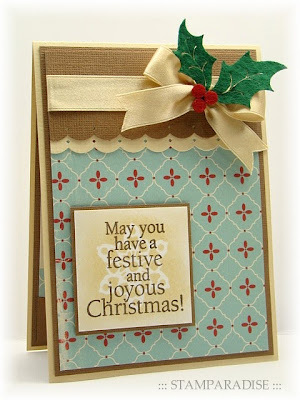 I added some gold satin ribbon and a felt holly to finish the card. I'm also entering this card to the following challenges. Thank you for stopping by today! See you next time. I made this card as one of works for my exhibition. 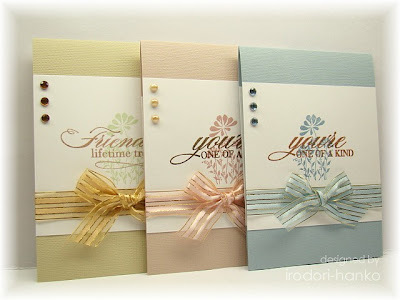 As the theme of exihibition is "Dear Friend", I'm making some frienship cards. This card was used the sketch from this weeks Crazy 4 Challenges(C4C12). The image was colored with Distress Inks and Holbein Artist Colored Pencils. Hmm... I think it was better that I didn't add any tiny pearls on the main panel. Hello everyone! 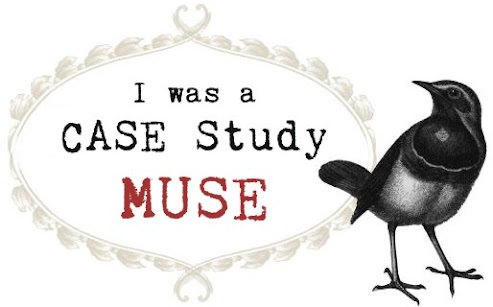 I have no card today, but I would like to let you know about my new blog. I received several messages and e-mails from some of the people who visited my blog. They said they liked my images and would like to use them to make a card/project. I was very glad to hear that! So I decided to provide you with some of my images for free. I've made a new blog to share my digital stamps with you. If you have time, please pop over HERE and check the details. Hello everyone! Don't you forget me?? lol! I have been pretty busy from last week due to my children's flu and some school events. This photo is a peek of my work for my exhibition. 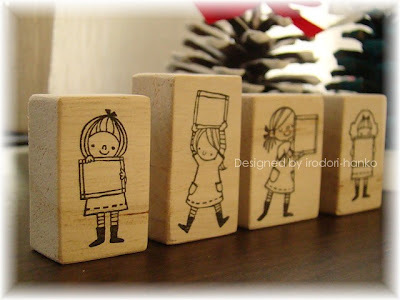 :-) I hope that the people who come to my exhibition like this stamp. Paper: American Crafts, Graphic 45, K & Co. 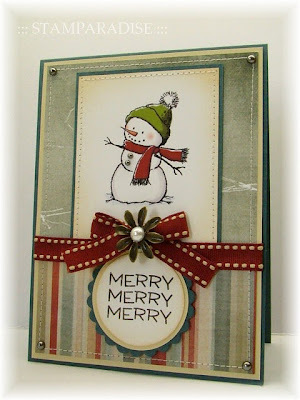 I made this card for this weeks Mercy's Tuesday Sketch Challenge (MTSC #47). 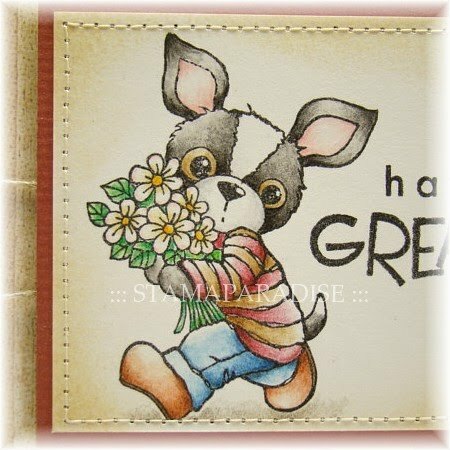 The puppies were stamped with Espresso ink (Versa Craft) and were colored with Holbein Artist Colored Pencils and Meltz Pen. Then I cut it out, and mounted with dimensional adhesives. 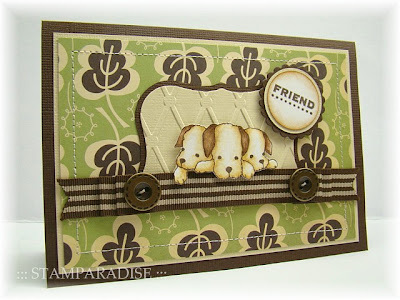 The back panel of puppies was cut with Nestabilities Label 1, and was embossed with QK embossing folder. 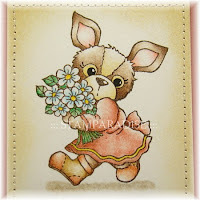 This card is for the Sweet Sunday Sketch Challenge #42 (SSSC 42). 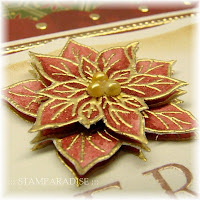 I started this card by carving a poinsettia stamp. 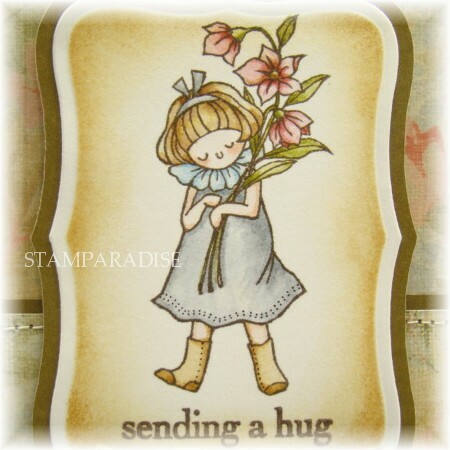 The size of this stamp is approximately 1-1/4" ×　1-1/4". 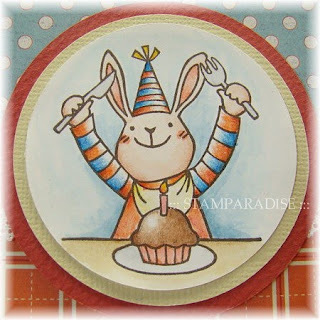 I stamped the image with Versa Mark and heat-embossed with gold embossing powder. 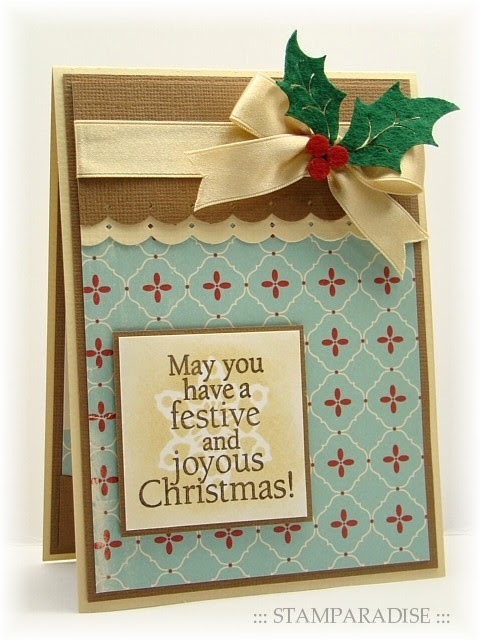 The sentiment was stamped with Jumbo Java ink(Versa Magic) and was heat-embossed with clear embossing powder. 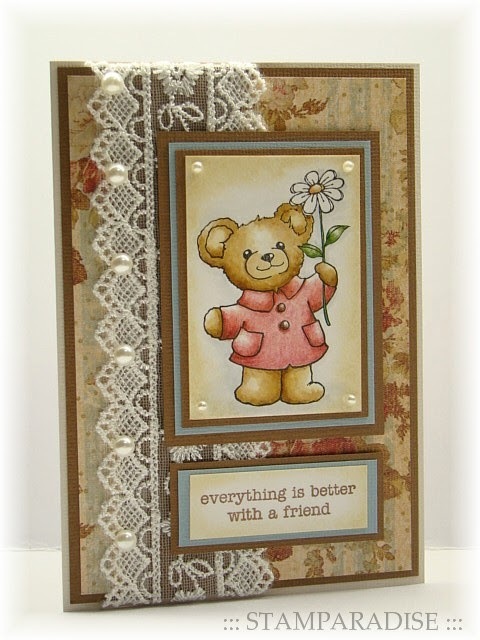 After cutting with the Nestability Label 8 die, I sponged with Antique Linen and Vintage Photo ink(Distress Ink). And then, I stamped and embossed the image twice, colored them with Aged Mahogany ink(Distress Ink). I cut them out and layered for dimensional. I did stitching with sewing machine on the backing panel, and added some gold Peel Off's, satin ribbon, and a couple of brads. This is a birthday card for my daughter, Honoka. She turns 9 on November 4th. She is a so cheerful and lively girl, and is always jumping like a rabbit! So I often have to say her to walk quietly. lol!! Hello everyone! 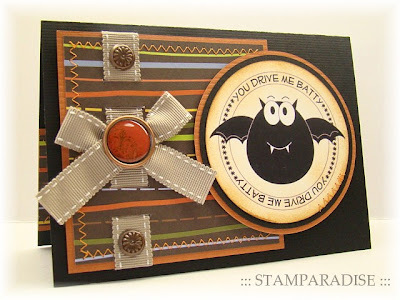 Today's quick post is a Halloween card I've made today. I'm sure that this is my last Halloween card this year. 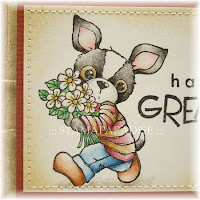 This card was used the sketch from the Taylored Expression Sketch Challenge #88 (TESC 88). The image I used is a digi which was drawn by Robin. Thank you Robin! You can see the other Halloween digis she provides for free HERE. The Pink Elephant #38 --- Recipe challenge - The Color Black, Hardware and Distressing. Hello everyone! I hope you have been enjoying this autumn days. 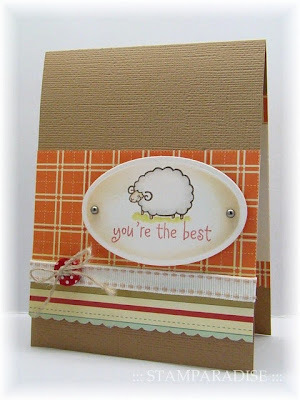 The 1st card is for this weeks Crazy 4 Challenges which is sketch challenge (C4C7). This card was completed without any particular technique (as usual??). lol!! 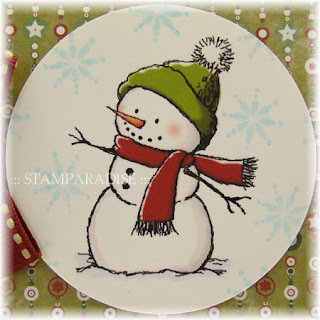 The little snowman is a digi image which was drawn by myself. The reason why I used a digi image is to save time. The snowflakes that have been stamped onto background are from Hero Arts. I followed the sketch and added some stitching with sewing machine, some stitched grosgrain ribbon, a bow and several tiny gems. The 2nd card is easy to make too!! The image is the same one as the 1st card. 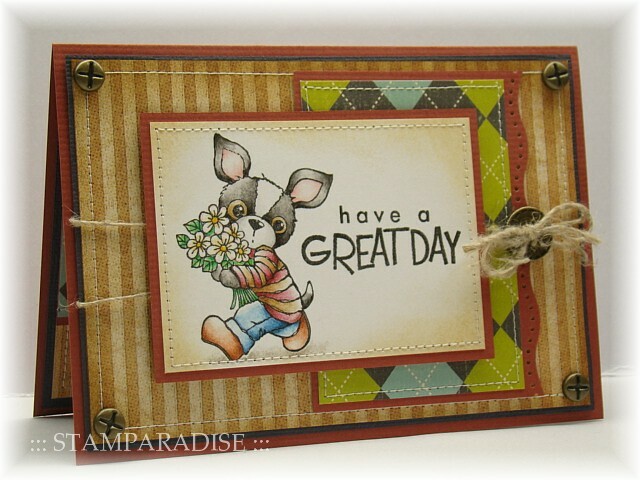 This card was used the sketch from Mojo Monday (Mojo 109). The edges of the main panel and the sentiment panel were slightly sponged with Antique Linen ink (Distress Ink). I matted and layered them, and sewed with sewing machine. 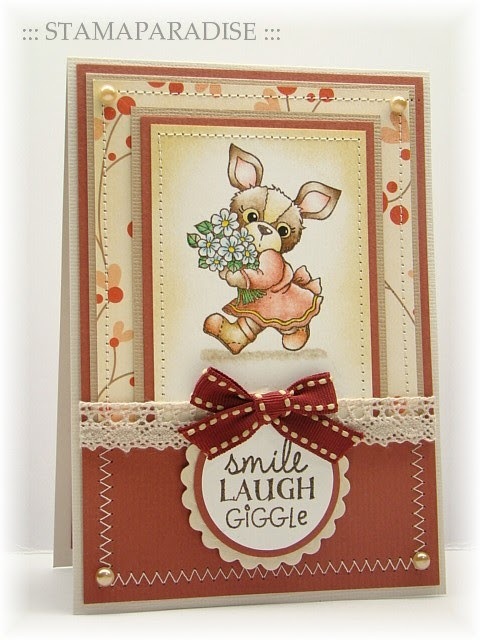 I added some ribbon, a bow, a metal flower and some pearls to finish the card. The card I show you today is quick and easy one! This card was used the sketch from Sweet Sunday Sketch Challenge (SSSC #39). 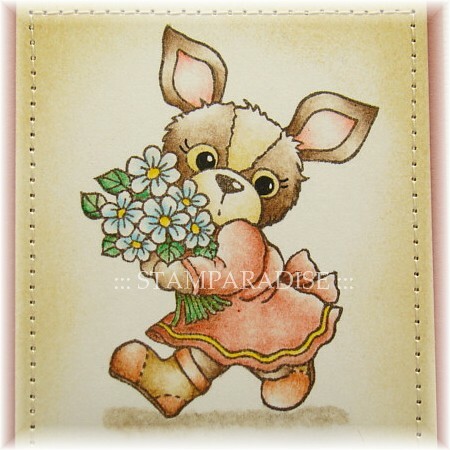 The image was stamped with Espresso ink(Versa Craft), and was colored with Holbein Artist Colored pencils and Meltz Pen. After I stamped the sentiment with Brick ink(Versa Craft), I sponged around the image with Antique Linen ink(Distress Ink). The bottom of the background layer was cut with scallop craft scissors(Kuretake). 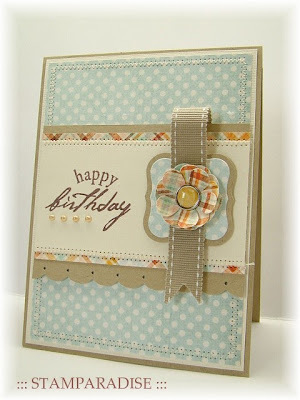 I added some stitched ribbon, a dotted button with linen twine and a couple of pewter pearls to finish the card. I just want to let you know about my small exhibition. I'm going to have an exhibition of my own hand-carved stamps at "petit morpho" from next January to February. 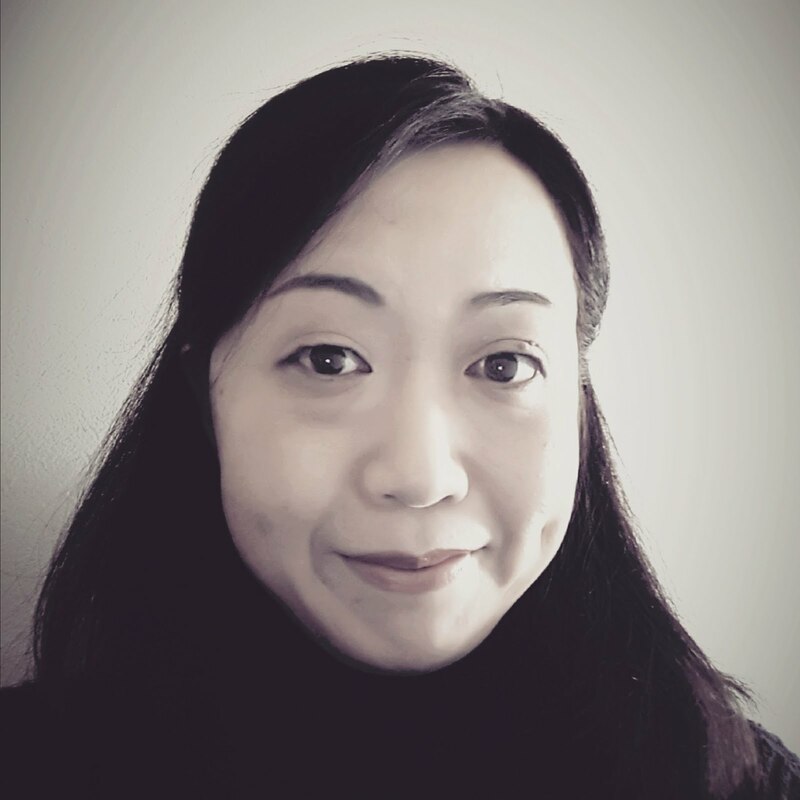 The "petit morpho" is a store specializing in rubber stamps in Hong Kong.The owner, Shizue Takehara is Japanese who loves rubber stamps and is intent on introducing Japanese hand-carved stamp artists to Hong Kong. I've set a theme of my exhibition as "Dear Friends", and have just started the preparations for it. For a few months, I have to use most of my time to carve a lot of stamps, and it will be difficult to find time to enjoy card making. But I hope I'll sometimes be able to make a card, and come back here! Thank you for stopping by today! Have a nice day!